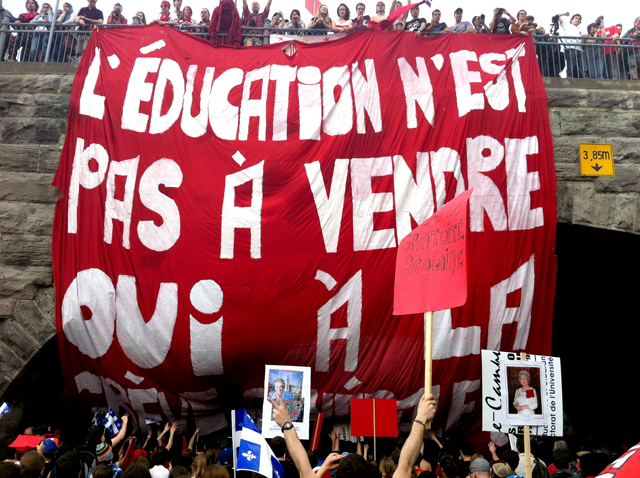 In June of 2008, then-Education Minister Michelle Courchesne said she would introduce a bill in the 2008 fall session of the National Assembly that would tighten governance at Québec universities as a result of UQAM’s $750 million Îlot Voyageur real estate fiasco. During each of the student protests that pass the corner of Berri street and Ontario street, demonstrators would point at the concrete skeleton that has languished, unfinished since 2008 and “boo” collectively at the symbol of the Education Ministry’s negligent management of our universities. Ironically, as Chair of the Treasury Council, member of the negotiating committee and signatory of the current “agreement”, Courchesne reveals her government’s recurring ineptitude that has not escaped the student movement and its supporters. Now, the government is attempting to offload its responsibilities to a Provisional Council that will pit students against university administrations, creating divisions in society rather than seeking genuine solutions and conciliation. I will vote against the government’s offer because it confirms the government’s insincerity in dealing with the student crisis and its incompetence at managing public institutions. A Montréal Bixi the day after the bixipoesie.ca action designed to oppose excessive advertisements in public spaces. The quote by Jean-Paul Sartre reads: “Every [person] must invent his [her] own path” – 30 April 2012. Based on reports by members from the student negotiation delegations, the government instilled a false sense of urgency to the 22-hour-long talks that left student representatives without sleep for two days. At one point during the negotiations, the students were told that their issues regarding the Provisional University Council would be accepted and that they would have parity representation. It was also suggested that a moratorium on tuition increases, would be the result of the Provisional Council findings, creating a sense of victory for student negotiators. Afterwards, student representatives were negotiated with separately, modifying a few words here and a few words there, effectively diluting the offer. Then, in another flurry of urgency, individual student negotiators were reconvened to sign the document that no longer resembled what they had previously understood. It would seem the government negotiated in bad faith. As striking students from all over Québec were either returning from Victoriaville or reading about the excessive violence at Liberal convention protest, Line Beauchamp quickly unleashed her media strategy with a press release that quotes her as saying, “To bring the current conflict to an end, we have reached an agreement between all the parties involved. I salute the respectful nature of the exchanges that have taken place during these last hours.” She wanted to show that the government had resolved the crisis, implying that a refusal from student association members would reflect student intransigence rather than their own. How the union leaders present around the negotiating table allowed this to happen is disconcerting. I will vote against this “agreement” because the current government reviles student criticism and continues to treat the student movement paternalistically, with arrogance and contempt. I will vote against this “agreement” because the current government has never considered the student proposals aimed at preventing further privatization of higher education and reduce tuition fees without passing on the burden of accessibility to the middle class. Jean Charest’s adherence to a Private-Public Partnerships (PPP) model of good governance has allowed his government to “invest” public funds into large infrastructure projects that the private sector later manages to reap the profits. Just ask SNC-Lavalin how it works to their benefit. One of the more interesting ideas that has been on the lips of students for months and has been absent in public debate, is the reinstatement of the capital gains tax on financial institutions. A slight 0.3% capital gains tax on financial institutions (banks, insurance companies, etc) would provide sufficient funds to freeze tuition to current rates with enough left over to effectively reduce tuition fees. A bit more could provide free tuition for everyone interested in a higher education. The Charest government actually cancelled the capital gains tax to financial institutions who continue to announce record profits, often in excess of $1 billion, every quarter. A recent Globe and Mail article, reports that “Canada’s debt-to-income ratio was 151 per cent at the end of ” and will probably rise to 160%, “a similar level to that of the United States just before the financial crisis.” An increase in tuition rates by 82% over seven years, and offering student loans that are guaranteed to the banks, the Charest government is adding the debt burden to middle class households while helping banks increase their profits. Jean Charest is handing out billions of dollars in public funds for his legacy project, Plan Nord, to build roads and extend power lines to open up northern Québec to the mining and forestry industry. The government’s $277 million subsidy to extend route 167 north of Chiboubamau, that will lead nowhere other than a future uranium (Matoush project) and diamond mine (Foxtrot project) is just one example that would alone cover tuition increases. I will vote against the government offer because it is a meaningless insult that does not adequately address any of my concerns. The “agreement” is a joke that Jean Charest is using to try to hide the fact that he wants users — Quebec citizens — to pay for access to higher education, hospitals, etc. in order to conform to his public-private-partnership (PPP) agreements. It is a joke, not unlike his remarks at the opening of the Salon Plan Nord (April 20, 2012 – Montréal), that laughs at society for allowing his government to continue to take from the public purse and give to the private vault. I will vote against the government offer because of the unscrupulous behaviour of the government who has no interest in public institutions, other than to deliver them to the private sector in exchange for the contents of a brown envelope and a lucrative seat in a corporate boardroom at the expiry of a political career. I will vote against the government’s offer and will continue to demonstrate my discontent in the street and elsewhere. I encourage all students, despite your position on tuition fees, to look past the tuition increase debate to see it as a symptom of a larger social malaise that needs realignment. I invite the 200,000 people who I walked with on March 22 to speak out against this “agreement”. Show your support for the student movement, which is not comprised of unfocussed spoiled youth who want everything for free – as the government and media like to portray them. It is a movement that believes, among other things, that having an educated and critical population is good for society. It would and will prevent self-interested governments from handing public property that doesn’t belong to them, over to private interests. This essay should be published on the front page of all newspapers. People need to become aware of this. This is a great critical look at our society today. Love it! If we all posted a link to this page in the comments section of newspaper articles maybe more people would read it. This “essay” shows a remarkable lack of comprehension of economic fundamentals, wholly ignores the perilous state of the current state of the provincial fiscal deficit (which is why tuition needs to be raised in the first place), and commits intellectual dishonesty by confusing unrelated arguments (Plan Nord and tuition hikes are unrelated concepts). I am certainly more interested in social fundamentals. Private corporations are currently being given $billions of public funds in government handouts while complaining that public educational institutions are underfunded and that individual users should pay the difference. Why not give less to profitable private corporations like banks who already overcharge the public for basic services and have them pay their fair share in taxes (as outlined in the essay). If mining and financial corporations paid their fair share in taxes (which they don’t even come close to doing) there will be enough funds in the government budget to eliminate the provincial fiscal deficit, provide free higher education, free daycare, free healthcare and would leave the middle class with less of a debt burden. If that’s not economically fundamental for the equitable society that I (and the rest of the striking students) want to build, then I embrace my lack of comprehension of your economic fundamentals. mmhm. It’s interesting how you focus on the middle class, as if the world should orbit around them. Because of course you are in it. The rich prey on everyone and the middle class prey on the lower class /rolleyes. What goes around comes around, cry me a river about your middle class debt burden. At least you had access to that capital to begin with. You want something real and important and lasting to come of this then you have to broaden your view some. Unfortunately, and certainly for your perspecive, we live in a world where social values interact with and constantly intersect with economic reality. Your perspectives do little of that. Your gerenalities sound good on paper and play to those who are uninformed or who don’t want to take the time to ‘fact-check’. What are the economic consequences of taxing the corporations, how many jobs might this impact, how much revenue will it actually raise, if there is no economic stimulus to invest in QUebec, will anyone want to? Do you think that one should put all the eggs in one public basket? Free everything for everybody and damn the debt or the cost? Perhaps you should show us the numbers, detail the conseuqences–there are some great examples in other countries with some real positive and real negative consequences. Everything has a price–nothing is or ever will be free. Sometimes the social, psychological or economic consequences are not so transparent. The most imortant thing in a society is information and in your article you present opinions. Maybe you should map out a more coherent plan that deals with the real ‘cost’ of this social dream that so many in this province have slumbered into. Every change in society needs to be assessed in terms of a balance sheet and your ideals need to be as well. Since you have pointed out actions without their consequences perhaps you should spend some providing a more balance argument especially for those of us who have been around a bit longer and have had to deal with the realities of everyday life for quite some time. And back to the tuition issue. It is a fact that the university system is in debt–it is under-funded, there are more expednitures than revenue and there are some serious infrastructure issues and lack of money for programs that benefit students more than anyone else. These are facts that can be verified. So if students are so opposed to help pay for the economic realities with their tuition, why hasn’t there been a single suggestion by any student group or boycott supporter like yourself, of a plan where students pay back to society in labor or time, the almost free education they receive? Why not a couple of years of service to society so that more resources could be directed to the universities? And how about students who take advantge of the Quebec tution signing a pledge to remain in Quebec for at least 5-10 years after graduation to make sure that society is paid back for their investment. There are many possibilities. Rather than point to someone else to solve the problem, why not, at the very least, take some initative and show some recognition that there is a problem and focus on all the possible solutions rather than denying the problem and passing the buck on to someone else. Everything you and other student organizations have proposed has a negative impact on tax payers. If you aren’t willing to contribute/commit now, how do we know you will later? A bit disingenuous don’t you think?